I recently saw a clip from “The West Wing” where a group of researchers debated the inherent bias of maps. I had never given the idea much thought. I think very few of us do. We are so use to maps being the way they are, and we are schooled into thinking that maps are displayed in the most logical way. However, there are some built in biases. A Mercator Projection map makes Iceland almost as big as African, when it is really a fraction of the size. But I won’t go into those details. Suffice to say that due to my interest in astronomy and general science, the debate got me thinking. 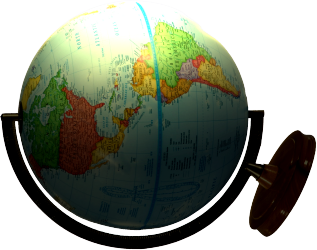 Why is a globe set up the way it is, with north at the top? Why are all depictions of the solar system displayed as if the system were resting on a table? The same is true for the galaxy, and why is that? In our natural world we think of the sun as rising and setting. But if we look at a table top depiction the sun would revolve around our sides. Of course in space there is no up or down, though we have to orient ourselves in some fashion. But why is north up, south down, east and west side-to-side, when we think of the sun as coming up? It is an accepted cognitive dissonance. Perhaps the ease of identifying the North Pole causes it to have prominence, and that is why it is at the top of the map and the top of the globe. But finding the South Pole is just as easy. Pick up a compass. The needle points both ways. Just ignore which end is painted red. Look up at the night sky. Polaris points out the North Pole, more or less. Using the Southern Cross, Alpha and Beta Centauri and a bright star called Achemar, one can locate the South Pole with as much accuracy as Polaris points out the North. In our natural lives we use phrases like ‘the wheel of life’ and ‘as the heavens wheel overhead.’ With the exception of some mechanics shops, most of the wheels I see are vertical, not horizontal. It seems to me when depicting the world we would think about it as we experience it, with the sun coming up and setting. Globes would be on their sides, so-to-speak, with the equator at the base. Similarly, as our solar system’s plane of the ecliptic is roughly on the galaxy’s ecliptic, we would think of the center of the galaxy, the center of the heavens as overhead, the Earth’s system being but a spoke in the great wheel of the heavens. In these modern times such depictions, especially in science-based tv programming, would be easy and a bit more natural. The only question then becomes, where is the top of the map? Does it face East or West? While sunsets can be beautiful things, since the dawn of humanity, sunrises have been the most important. When Helios chases away Selene, the Titan God of the Moon, and brings light and warmth all our night terrors fade. We equate, and rightly so, light with life. It is simple. The East where the sun appears to rise is far more important than the West where things go to end. The next time you use a map or globe, give it some thought. Put the East at the top, following the sun’s path over head, with the center of the galaxy above you. Just remember that North is to the left. This entry was posted in Philosophic, Weird Science and tagged Science. Bookmark the permalink.